Fixed base routers are there for more than five decades and have been one of the most relied tools of the carpenters all around the world. These wood routers have a fixed base that ensures a fixed distance between the router bit and the base. These routers are widely used for high precision wood cutting and crafting. However, the user needs to know how to use a fixed base router? 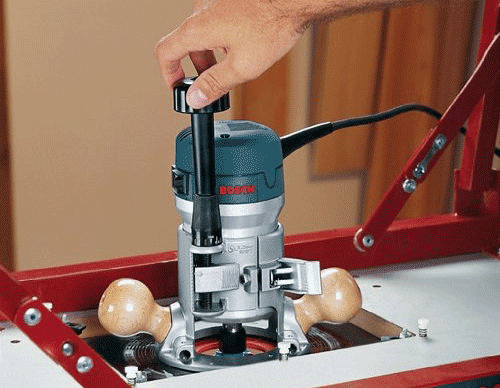 Fixed base routers are powerful electrical machines which use a carbide tipped bit rotated at a very high RPM to cut through all kinds of wooden surfaces to make designs and give shape to the wood. Before routers carpenters used to cut the wood manually using specially cut wooden frames. To cut wood using these frames required a lot of time and precision. The wooden frames were large, so the carpenters were forced to have a lot of space in their workshops to store these cutting frames. Fixed base routers evolved to plunge base routers but both have different applications. Here are some of the applications of fixed base routers. In order to cut using a fixed base router one has to ascertain which design they need to cut. When the design is selected one should follow the following guide how to use a fixed base router to give the perfect cut. When you have selected the design, select and replace the router bit with the design that you want to cut. One should make sure that the router is plugged out when replacing the bit. For a fixed base router to perform, one needs a router table. However, if you do not have a router table, you will have to prepare a base that can hold the wooden piece firmly when you cut it. You can even make your own custom made base for enhanced comfort and perfection. Before you turn on the router, make sure that you have already marked the path of the router using a marker or a pencil. A marked path is the best way to ensure precise cutting and great designs. Before turning on the router, make sure you are wearing protective gears on both eyes and ears. Routers make a loud noise that can damage your ears on prolonged exposure. 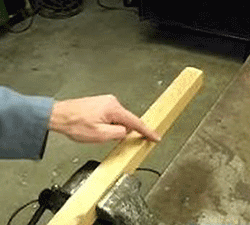 The router bit throws wood projectiles capable of doing severe injuries to eyes. So, one should never turn on the router before wearing the protective wear. Decide a point to start cutting, always start from one corner and try to make a straight cut to the other corner, then turn the router to the other direction for a cut in the other direction. It is best to turn off the router when changing directions for a more precise cut. When you have started the cutting process, always ensure that you do not stop in the middle. The only point to stop are the corners where one has to make a turn. Stopping at the center of a cut creates imperfections. If you follow this step by step guide on how to use a fixed base router, you can reduce on the wastage of raw material that happens when there are wrong cuts. The guide also helps you to ascertain all safety measures are in place while cutting. Bosch 1617EVS is a powerful 2.25 Hp router that runs on a 12 amps motor. 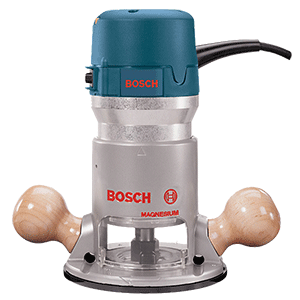 The motor offers a high speed cut between 8,000 and 25,000 RPM’s ensuring that every type of wood and every type of job can be processed with high precision. The best feature of the router is that it can work with both ¼ inches and inches shanks ensuring that you can practically do every single application with one router. The router is built to last and has a rugged aluminum body that can ensure durability in every work condition. The router comes with a one year warranty. However, it comes from the German manufacturer Bosch which is known for its engineering and durability. The fixed base router reviews clearly give this router an edge over other best fixed base routers available in market because of its durability. Q: What kind of users should prefer this fixed base router? A: Fixed base router is better for users who prefer to have a high precision cutting, one can easily do repetitive jobs with a fixed base router. Q: Can I do plunge base application with Bosch 1617 EVS? A: If you have a lot of plunge applications, you can buy an additional compatible plunge base for the router which is sold separately by Bosch. 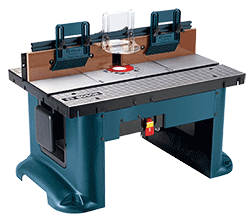 Q: Do I need a router table to use this router? A: We highly recommend you to buy a router table for high precision cutting. Without a router table, there is a great chance of poor cuttings with imperfections. Q: Is one year warranty a deal breaker? A: Bosch offers standard one year warranty for almost its every tool. However, the professionals tell that the tools from Bosch are much durable than its competitors who offer longer warranties. There is no better cutting machine than a fixed base router for high precision cutting. One should understand that a fixed base router offers an unmatched stability which enables it to give a perfect straight cut every single time. One should learn how to use a fixed base router for a more precise straight cutting. The fixed base router reviews indicate that there is no better machine for straight cuts than some of the best fixed base routers. When you need to cut multiple pieces of wood into a specific shape and size you need to use a fixed base router for high precision. When you prepare a base to fit in every piece you need to cut, all you need to do it to put the router on the same spot to get a perfect cut. There are many tutorials and videos on how to use a fixed base router for repetitive tasks. The fixed base router reviews rate best fixed base routers to be far more superior than plunge base router for repetitive tasks. 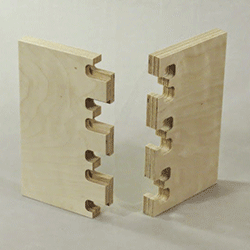 When you need to make a symmetrical design, a fixed router is the best tool you can get. It gives the designs same depth, width and every property need for a design to be symmetrical. 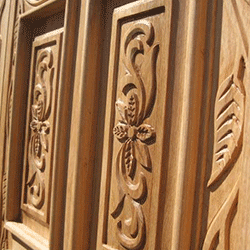 One can learn to make symmetrical designs from how to use a fixed base router tutorials. The fixed base router reviews conclude that best fixed base routers are far more superior than plunge routers for making symmetrical designs. Fixed base routers are necessary cutting machines which completely change the lives of carpenters. One should understand that price should not be a matter of consideration when buying a router. High end equipment from top manufacturers like Bosch last for more than a decade which justifies the investment made on them. While using, one should never even turn on the router without protective gear. 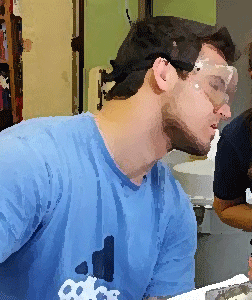 One should always wear protective gear for both ears and eyes while using a fixed base router. The precision of the cut and finish depend on how comfortable you are while cutting the wood and how stable is the piece of wood that you are trying to cut. 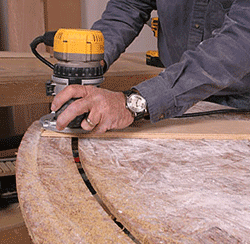 A router table enhances stability and improves the efficiency of the router.